PennzoniDisplay.com offers an excellent selection of sports display cases for all sports fans and collectors. Find the jersey display case or football helmet display case that will turn your memorabilia into an eye-catching focal point. 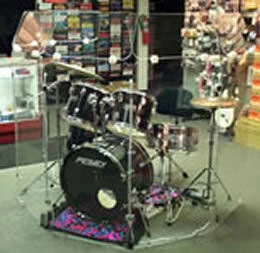 Musicians also will find instrument Drum Screens , Drum Booths and practical items such as drum shield & drum shields. Check out our Bird Cages , card display cases and Guitar Display Cases. so learn more about PennzoniDisplay.com by reading our articles. 1-269-651-9975 call us ! We have a wide variety of Acrylic sports Display Cases for you to choose from. Display your favorite sports balls, collectibles and we even carry display cases for limited edition cereal boxes! Some of our Acrylic sport Display Cases are Baseballs display cases, football display case basketball display case, Football helmet display case.. Click here for more information and pricing. options and pricing, click here. Showcase your favorite baseballs in our quality Baseball display cases. We have many sizes to choose from along with combination baseball/puck, and baseball/card display cases. Click here for more information on our Baseball Display cases. Our Baseball Bat display cases come in sizes to accomodate 1 to 5 bats. Or, maybe you would like a Bat/Ball/Card display case. All our wooden baseball bat display cases, including the Bat/Ball/Card case are available in a black or cherry finish. 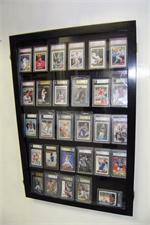 We also have Baseball display cases Click here for details. Our Tabletop baseball card Showcases are great for transporting and storing valuable baseball cards to and from shows. These Tabletop baseball card display cases & Showcases are hinged in the middle for easy folding. Both styles of our baseball card Tabletop baseball card display cases , Showcases come with a pair of legs to allow the case to standup. Click here to see photos of our baseball card Tabletop Showcases in use. Proudly display your baseball card collection for everyone to see with our Wallmount baseball card display cases & Showcases. Available in different sizes and finishes. Our new PSA Garded card display cases Wallmount Showcases will hold 40-50 PSA and Graded cards and are available in Glossy Cherry, Glossy Black, and Golden Oak. Click here to choose your favorite from our selection of Wallmount Display Cases to display your card collection. Our bird cages and bird carriers are designed for parrots by owners of parrots and bird cages are easy cleaning with pull out bottom cleaning trays, Lixit Quick- Lock Crocks feeders, Manazanita perch, Many toy holders and solid hardwood cabinets for storage. Parrot tested ! !, Hypo-allergenic and Brass casters and Locks. We also carry a Solid hardwood and PVC Perch that is very sturdy and durable. Use this Flag Case in oak or our acrylic Flag display case to protect and display your treasured flag. Our flag cases are well built for your Flag. certainly have you covered. We have nascar diecast Car Display Cases that will hold 100 cars! Click here to see them. HOLDS TOBACCO TINS that are 6" tall x 1 1/2" thick or less. THE OUTSIDE DIMENSIONS ARE: 38" x 34.5" x 2 3/8th" deep THE INSIDE DIMENSIONS ARE: 36.5" x 33" x 1.5" deep. PLEASE MEASURE YOUR ITEMS TO MAKE SURE THEY WILL FIT IN OUR CASE.